Of all the twists and turns in the rock career path, the one signposted ‘I’ve cleaned up’ is probably the least loved. Journalists feign interest in the former addict’s new ostrich milk and organic beansprout regime; record execs wonder where their cranky, multi-talented visionary has disappeared to; lifelong fans shrug and utter the immortal line: ‘I always preferred the early stuff anyway’. Yet the news that Evan Dando has been sober for nine months whilst recording ‘Baby I’m Bored’ comes as a relief. Few outside Al-Qaida will ever experience wilderness periods to match the seven year exile since the Lemonheads’ muddled swansong ‘Car Button Cloth’. With Evan Dando, nothing is as it seems. “I can’t believe how far I slid/But secretly I’m glad I did” he whispers two minutes and five seconds into ‘The Same Thing You’ve Thought Hard About Is The Same Part I Can Live Without’ and you know the strange magic he possesses will never desert him. 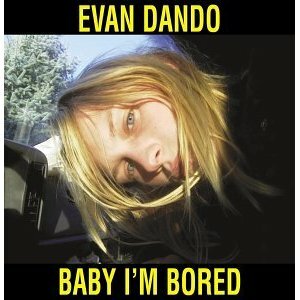 Where others find that without substance abuse they have no substance to abuse, Evan’s role as a dopey modern day Gram Parsons – albeit playing plaintive guitar-pop – still fits. Give him an acoustic guitar and a microphone it seems and these sleepy, humble hymns to a murky past just tumble out of him. Odder still, two of the best songs here: ‘Hard Drive’ and ‘All My Life’ – written by long-‘term acolyte Ben Lee – manage to sound more like Evan’s druggy confessionals than Evan himself, right down to the stoned sentiments (‘All my life/ I thought I needed all the things I didn’t need at all’). Stalkers rarely come in so useful. “I’ve been doing monitors for Enya” Dando wryly declared when asked where he’d been all these years. The good news is that he didn’t learn a thing.